Do I need a guitar, bass or ukulele for my first lesson? No. You are welcome to use one of our studio guitars, basses or ukuleles for even your first couple of lessons if you wish. At some point you’ll need an instrument to practice on at home, and we are happy to provide you with a list of appropriate instruments that you can purchase, along with contact information for local musical instrument retailers. Many of our beginning students actually take their first couple of lessons before purchasing their own guitar, bass or ukulele – and then they can rely on the expertise of our instructors to help them make a wise purchase decision. Do I need a violin or cello for my first lesson? No. You are welcome to use one of our violins or cellos for even your first couple of lessons if you wish. Before you purchase or rent a violin however, you must be sized (this is based on the students arm length). We can recommend a violin and cello shop for either a rental or purchase, where they can also size the student prior to purchase or rental. 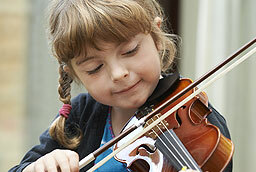 Many of our beginning students actually take their first couple of lessons before purchasing their own instrument. My child really wants to learn the drums, but I can’t stand the noise! What should I do? New electronic drum kits can now be purchased for less than acoustic drum kits – and they are virtually noise free! Students can plug head phones into an electronic kit and play with very little sound; this option is great especially if you live in an apartment or condo. The action and feel of these electronic drum kits is often close enough to an acoustic kit and can provide years of enjoyment in practice and play. I would like to take voice lessons – will I need to practice? Yes, you will need to practice in order to make progress when you are a voice student. The voice is also considered to be an instrument, which means that only through regular practice and the correct training can you improve your performance and technique. Our instructors will craft a specific, tailored practice plan to help you use your voice to the fullest ability and take your singing to the next level! 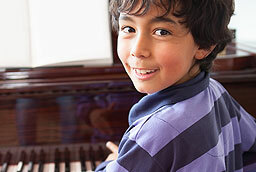 It is ideal if you do have a piano at home, but you can start lessons by using an electric keyboard to practice on. Most of our students rent or buy small electric keyboards to practice on at home. We recommend a keyboard that has regular sized keys and a touch sensitive response. A touch sensitive keyboard means if you press a key harder it will play louder and if you press a key softer it will play quieter. We also rent our practice rooms for $10.00/hour for students who wish to practice at our facility (space permitting). 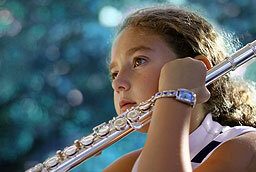 Do I need a saxophone, trumpet, clarinet or flute for my first lesson? Yes. We do not carry spares for these instruments and it is not sanitary for instructors to loan these instruments out to their students. We are happy to refer you to a local shop for rental or purchase. We regularly have had adults ask if they are too old to learn an instrument (we get this question from adults of all ages – even adults in their 30’s). Our answer is you are never too old to learn an instrument. Playing a musical instrument brings joy to people of all ages. If you have the desire and interest we recommend giving it a try – numerous studies have proven that studying music creates helpful brain activity in adults and can provide a version of musical therapy that can be very powerful and positive. We are currently teaching several retirees who are in their 70’s that started as beginners with us. There is no set amount of time that it takes to learn an instrument, the main reason being that most students learn at a different pace. The real key to learning an instrument is simple – regular practice, and a basic level of playing can be accomplished in only a few months. Most of our students take lessons on a long term basis because they find that the lessons are enjoyable, and they wish to continue their growth and improvement on the instrument. Yes. Even if you don’t have any musical experience you can still rely on the instructor for advice on how to help the child practice. Parents who get involved in their child’s lessons often find it rewarding – and it’s also helpful to the student. 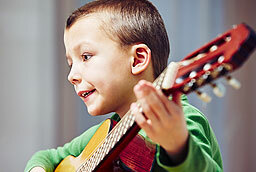 Many parents will occasionally sit in on the child’s lesson to get an idea of how the song should go and how they should be holding the instrument.